As introduced last session by Sen. Dan Watermeier of Syracuse, LB44 would apply to retailers outside the state if their sales to Nebraska purchasers exceed a certain amount. As amended on select file, the bill would require a retailer that does not collect state sales or use tax to notify Nebraska purchasers that the tax is due and to send them an annual notice showing the total amount paid for taxable items. A non-collecting retailer also would be required to send an annual report to the state Department of Revenue showing the total amount paid for taxable items by Nebraska purchasers. The requirements would apply to retailers with more than $100,000 in total annual sales of taxable items or 200 or more separate transactions to Nebraska purchasers. The notice and reporting requirements would end on the later of July 1, 2018, or the first day of the first calendar quarter after a court decision or federal legislation repeals the physical presence requirement of a 1992 U.S. Supreme Court case. After that, a retailer without a physical presence in Nebraska would be subject to state sales and use tax if it meets the sales threshold. In Quill Corp. v. North Dakota, the court found that states could not collect sales tax from retail purchases made over the internet if the seller does not have a physical presence in the state. The justices will rule on a South Dakota case challenging the Quill decision during the court’s 2018 term, which ends in June. Watermeier filed a motion on final reading to return the bill to select file for an amendment that he said is a compromise with Papillion Sen. Jim Smith and Gov. Pete Ricketts. The amendment would remove the notice and reporting requirements to ensure that the bill is passed and signed into law this year, Watermeier said. “Although I thought it was imperative to be covered either way—through reporting if the court didn’t overturn Quill and collection if it did—most people are now fairly confident that Quill will be altered or overturned,” he said. Sen. Tom Briese of Albion spoke in support of the amendment, saying that it addresses concerns that the Supreme Court could only partially repeal Quill’s physical presence requirement. Smith said the amendment is necessary to remove the reporting requirements, which he said create an unnecessary burden on businesses. However, even with the amendment, the bill does not create certainty that state sales tax on internet purchases will be collected, he said. “Passage of this bill does not assure that the state sales tax collections will increase or that our local retailers will be helped,” Smith said. 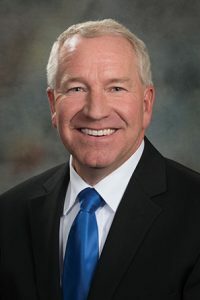 Sen. John Kuehn of Heartwell opposed the amendment and the bill, saying that it would set a dangerous precedent to create tax law contingent on a Supreme Court decision. He said the Legislature should wait for the court’s decision and then decide what course of action to take when it reconvenes in January. Watermeier then filed a motion to invoke cloture, or cease debate and vote on the bill. The motion failed on a 31-13 vote. Thirty-three votes were needed. The bill is unlikely to be scheduled for further debate this session.